Because none of this material could be written down but was passed by word of mouth from generation to generation, changes naturally occurred. Often a tale traveled from one tribe to another and was incorporated, in whole or in part, into the tribal lore of the neighbor—thus adding something. And, we may suppose, some were more or less forgotten and thus lost; but, as Wissler tells us, "tales that are directly associated with ceremonies and, especially, if they must be recited as a part of the procedure, are assured a long life." Such of these tales as were considered sacred or accounted for the origin of the people, were held in such high regard as to lay an obligation upon the tribe to see to it that a number of individuals learned and retained these texts, perhaps never in fixed wording, except for songs, but as to essential details of plot. Many collectors have recorded several versions of certain tales, thus giving an idea of the range of individual variation, and the writer herself has encountered as many as three variants for some of her stories, coming always from the narrators of different villages. But Wissler, while allowing for these variations, says: "All this suggests instability in primitive mythology. Yet from American data, noting such myths as are found among the successive tribes of larger areas, it appears that detailed plots of myths may be remarkably stable." However there is another point discussed by Wissler which troubled the writer greatly as a beginner, and that was the intrusion of new material with old, for instance, finding an old Hopi story of how different languages came to exist in the world and providing a language for the Mamona, meaning the Mormons, who lived among the Hopi some years ago. The writer was inclined to throw out the story, regarding the whole thing as a modern concoction, but Wissler warns us that: "From a chronological point of view we may expect survival material in a tribal mythology along with much that is relatively recent in origin. It is, however, difficult to be sure of what is ancient and what recent, because only the plot is preserved; rarely do we find mention of objects and environments different from those of the immediate present." A tale, to be generally understood, must often be given a contemporary setting, and this the narrator instinctively knows, therefore the introduction of modern material with that of undoubted age. Stability, then, lies in the plot rather than in the culture setting; the former may be ancient, while the latter sometimes reflects contemporary life. Boaz argues that much may be learned of contemporary tribal culture by a study of the mythology of a given people, since so much of the setting of the ancient tale reflects the tribal life of the time of the recording. He has made a test of the idea in his study of the Tsimshian Indians. From this collection of 104 tales he concludes that: "In the tales of a people those incidents of the everyday life that are of importance to them will appear either incidentally or as the basis of a plot. Most of the reference to the mode of life of the people will be an accurate reflection of their habits. The development of the plot of the story, further-more, will on the whole exhibit clearly what is considered right and what wrong." There are set times and seasons for story-telling among the various Indian tribes, but the winter season, when there is likely to be most leisure and most need of fireside entertainment, is a general favorite. However, some tribes have myths that "can not be told in summer, others only at night, etc." Furthermore there are secret cults and ceremonials rigidly excluding women and children, whose basic myths are naturally restricted in their circulation, but in the main the body of tribal myth is for the pleasure and profit of all. Old people relate the stories to the children, not only because they enjoy telling them and the children like listening to them, but because of the feeling that every member of the tribe should know them as a part of his education. While all adults are supposed to know something of the tribal stories, not all are expected to be good story-tellers. Story-telling is a gift, we know, and primitives know this too, so that everywhere we have pointed out a few individuals who are the best story-tellers, usually an old man, sometimes an old woman, and occasionally, as the writer has seen it, a young man of some dramatic ability. When an important story furnishing a religious or social precedent is called for, either in council meeting or ceremonial, the custodian of the stories is in demand, and is much looked up to; yet primitives rarely create an office or station for the narrator, nor is the distinction so marked as the profession of the medicine man and the priest. As to the service of myth in primitive life, Wissler says: "It serves as a body of information, as stylistic pattern, as inspiration, as ethical precepts, and finally as art. It furnishes the ever ready allusions to embellish the oration as well as to enliven the conversation of the fireside. Mythology, in the sense in which we have used the term, is the carrier and preserver of the most immaterial part of tribal culture." There comes a time in the Hopi year when crops have been harvested, most of the heavier and more essentially important religious ceremonials have been performed in their calendar places, and even the main supply of wood for winter fires has been gathered. To be sure, minor dances, some religious and some social, will be taking place from time to time, but now there will be more leisure, leisure for sociability and for story-telling. 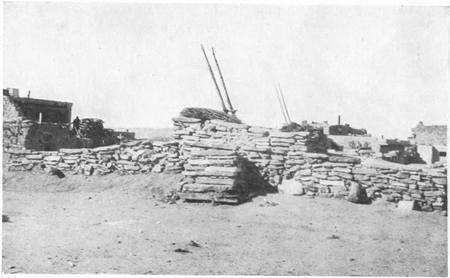 Figure 4.—Kiva at Old Oraibi.—Courtesy Arizona State Museum. In the kivas (See Figure 4) the priests and old men will instruct the boys in the tribal legends, both historical and mythological, and in the religious ceremonies in which they are all later supposed to participate. In the home, some good old story-telling neighbor drops in for supper, and stories are told for the enjoyment of all present, including the children; all kinds of stories, myths, tales of adventure, romances, and even bed-time stories. Indian dolls of painted wood and feathers, made in the image of the Kachinas, are given the children, who thus get a graphic idea of the supposed appearance of the heroes of some of these stories. The Hopi, like many primitive people, believe that when a bird sings he is weaving a magic spell, and so they have songs for special magic too; some for grinding, for weaving, for planting, others for hunting, and still others for war; all definitely to gain the favor of the gods in these particular occupations. Without books and without writing the Hopi have an extensive literature. That a surprising degree of accuracy is observed in its oral transmission from generation to generation is revealed by certain comparisons with the records made by the Spanish explorers in the sixteenth century.